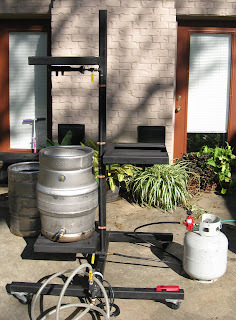 I purchased a used 3-tier stand yesterday from a local homebrewer. In brief, it is professionally welded 2″ box iron. The vessels are all converted kegs with weldless quick-disconnect fittings. Propane is hard plumbed up the center support. 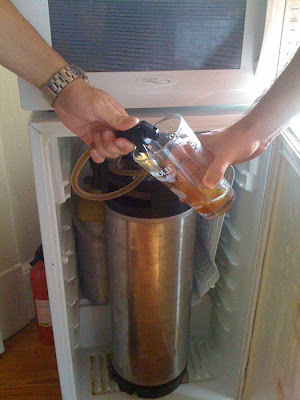 Before plunking down money Clint invited me to make a batch of beer with it. This is that beer’s story. Clint and I started heating strike water around 9:15 Saturday morning. Doughed in with 1.3 qts/lb of RO and tap water to rest at 145° F for 30 minutes. Direct-fire heat to bring the temperature up to 160° F for another 30 minutes. Sparged with 170° water to collect about 6 gallons sweet wort. Boiled 60 minutes. 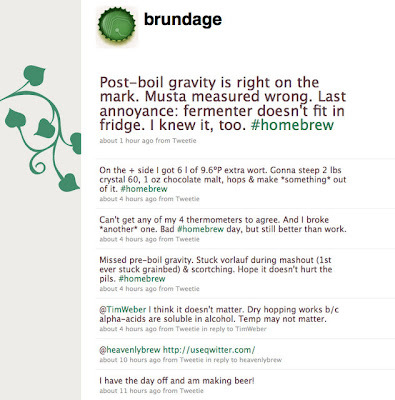 We were done and cleaned up by about noon-thirty, making a relatively quick brewday. OG was 14.6 °Brix with an estimated 51 IBUs. I call it Bitter Blonde. I love the recirculating mash and all the direct-fire vessels. The mash tun and hot liquor tank have temperature probes for use with common digital oven thermometers. That gives me fine control over the mash, meaning when I find a recipe I like I can accurately record and recreate it. The kettle doesn’t have a sight glass which is critical to me. Kettle volume combined with the gravity of the sweet wort is a guide to hitting target OG. My current 20 gallon aluminum kettle has a sight glass and fits on the bottom burner, so I will continue to use it (and I already have a prospective buyer for the keggle). I also get a March pump with the deal, doubling the number of pumps I have. Now I have a spare mash tun and HLT which will go up for sale. 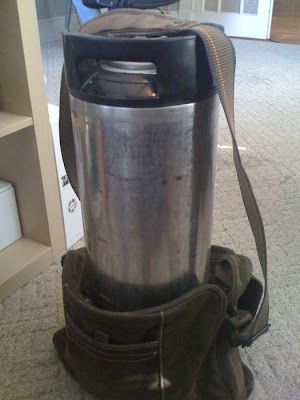 It is a little sad to see my mash tun go because it is the second piece of homebrewing equipment I made – the first being an immersion chiller which was sold long ago. Bitter Blonde is bubbling away in my 6.5 gallon carboy. Looking forward to tasting it and brewing again on my new brewstand.